Western lowland gorillas are found in Central African Republic, Equatorial Guinea, Gabon, Republic of Congo, Angola, Cameroon, and the Democratic Republic of Congo. 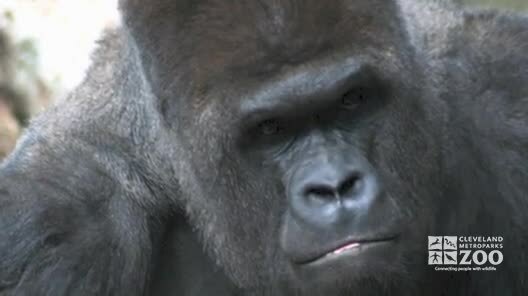 The western lowland gorilla inhabits lowland tropical forests and swamp forests. 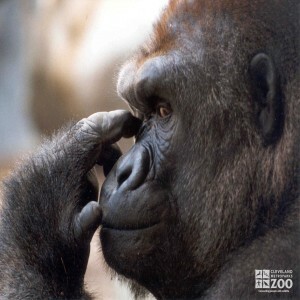 Gestation in the western lowland gorilla lasts about 8.5 months (on average 256 days). Western lowland gorillas give birth to one offspring at a time, though rare instances of twining have occurred. Although western lowland gorillas are primarily terrestrial, like other primates they are capable of climbing. Surface locomotion is quadrupedal, with the soles of the feet and the middle phalanges of the fingers placed on the ground during locomotion. They are diurnal, with most activity taking place between 6 a.m. and 6 p.m. In the evening gorillas will make nests in the trees, nest making during the day has also been observed. Although they are nearly entirely vegetarian, they will occasionally eat insects. Gorillas are social, living in groups. When two groups meet they may ignore each other, temporarily associate, or express hostility. Groups can range from 2 to 30 in number and are commonly composed of an adult male, several adult females and their immature offspring. Males who are unable to acquire females will either form all male groups, referred to as bachelor groups, or will live alone. Gorillas communicate through a combination of vocalizations (including grunts, rumbles, whimpers, whines, and play chuckles), gestures and body posturing. There is no evidence of a breeding season for western lowland gorillas, and females give birth once every 3½ to 4½ years unless the infant dies. The estrous cycle lasts 26 days, with estrus being 1 to 3 days. Physiologic sexual maturity is 8 years for females and 10 for males, although breeding does not usually occur until 10 in females and 15 in males. Females will often give birth to only 2-3 offspring in her lifetime. In the wild gorillas have a diverse diet of 180 species of plant. From these plants gorillas will consume bark, fruit, flowers, herbs, leaves, pith, roots, seeds, shoots and stems. In addition wild gorillas have been observed to consume ants and termites. The gorillas’ primary diet consists of romaine lettuce, dandelion greens, endive, alfalfa hay, green beans, fruit, resistant starch, and flax seed. The gorillas also receive browse (branches from local tree species when available) and multivitamins.